Java Fern! How to propogate this aquatic plant. Basic guide and everything you need to know to keep your java fern green, plus tips. Ferns and mosses are fun and interesting plants to decorate aquariums with! Ferns, Moss, and Liverworts are non-flowering plants. They are not capable of forming seeds but propagate by microscopic spores. The water loving Mosses and Liverworts (Bryophyta) are lowly spore bearing plants found all around the world. But only the common Liverwort, Riccia, and a few of the mosses are widely used in aquariums. Ferns (Pteridophyta) are also water loving, spore bearing plants, but these differ from Liverworts and Mosses in that they are propagated partly vegetatively and partly by spores. 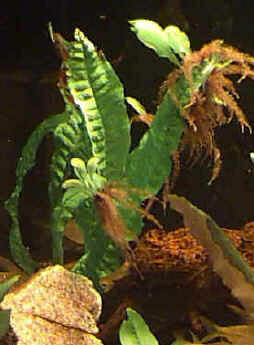 Ferns often produce roots from rhizomes, which attach to rocks or wood ornaments in the aquarium. For the aquarist, the easiest methods of propagation are vegetatively, either by dividing the rhizomes and stems or by separating new plantlets developed directly on the leaves of the parent plants. Ferns: Water Sprites have a plant structure in either wide or narrow leaf forms. They are a beautiful light green with deeply cut fronds that can reach up to a foot long. They have good plant growth, are very fast growing and readily propagate. They grow well rooted or as a floating plant. Excellent for providing hiding places for baby fish, so are a favorite of fancy guppy breeders. A good example is the Oriental Water Fern, or Water Sprite, Ceratopteris thalictroides. Mosses: Of the moss types, the Willow Moss, Fontinalis, is a tough moss found in fast moving streams. It doesn't grow well in the aquarium, even with good plant care, and will slowly deteriorate, it is good cover for baby livebearer fishes and will receive spawns of some types of Panchax fish and other fishes. So it is used by breeders as a temporary plant. Liverworts: Crystalwort, or Floating Liverwort, Riccia fluitans, has bright green tufts and float just beneath the surface. They are great for hiding babies of livebearing fishes, but can interfer with the light needed for rooted plants below if allowed to cover the aquarium, and it doesn't do well in soft water.